The 9 Best Fall Festivals in Utah! Fall is a big deal in Utah. So much so, that fall is probably the busiest season of the year. Undoubtedly, it is also the most festive. The truth is, in Utah, you’d be hard pressed not to find an incredible festival to attend nearly every weekend in September and October. To truly immerse yourself in the season, check out our favorites. Meet Oktoberfest at Snowbird Resort in Little Cottonwood Canyon: thousands of miles away from Munich, but still wonderfully reminiscent of the old world. 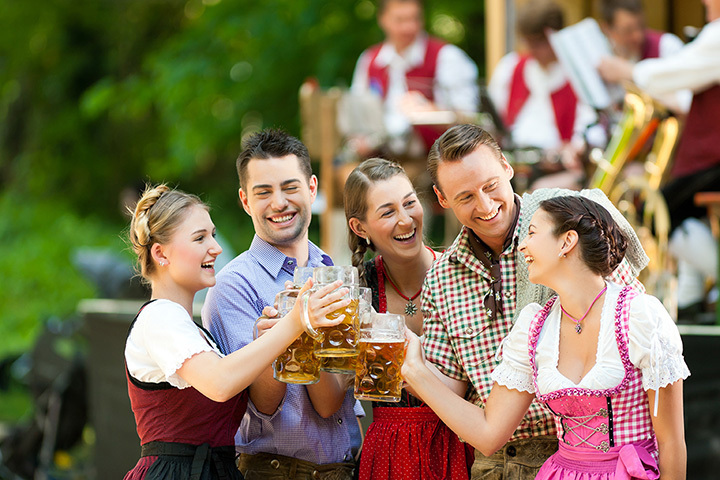 Attracting 60,000 visitors every year, Oktoberfest is home not only to beer, but live music, a beard and mustache competition, and a bratwurst eating competition, and plenty of other diverse forms of entertainment. You’ve probably heard of the Day of the Dead, but have you ever celebrated it? Now’s your chance. At Thanksgiving Point in Lehi, Dia de los Muertos is in full swing every year at the end of October. Not only are Utahans (and visitors) are invited to create their own altar dedicated to a deceased loved one, but you can enjoy mind-blowing Mexican food, performances, and beautiful art. This is family history with an interesting and educational twist. A witchstock festival isn’t necessarily what you’d expect from a charming Northern Utah city, but so is the case in Ogden, where large crowds gather downtown dressed as witches and other ghouls. The festival includes a “Zombie Crawl” and a “Monster Bash,” (a large dance for excited attendees), in addition to plenty of other Halloween themed activities. Home to the Grand Staircase-Escalante National Monument, Escalante is a small town in Southern Utah with a rich heritage and beautiful red rock views. It is a center for tourists, lovers of the outdoors, locals who have been there for generations, and—at least near the end of September—a sizable group of working artists and artisans for the Escalante Canyons Art Festival. With various art exhibitions, a painting competition, workshops, and live music, the festival is Escalante at its liveliest. Only in its third year, the Festa Italiana at Salt Lake City’s Gateway will not only fulfill that pestering cannoli craving, but expose you to the beauty that is Italian culture and cuisine. Designed as an “Italian Street festival where you can experience the tastes, sounds, and culture of Italy,” Festa Italiana is free and definitely worth a lazy Saturday afternoon. Organized by the Utah Arts Alliance, the Urban Arts Festival in Salt Lake City is the largest free community art event in Utah. A celebration of the community and its incredible artists and creators, the festival makes for a wonderful day with the family, a loved one, or even on your own as your meander through different exhibits and watch enchanting performances. If you want to see herds of sheep walking down the street, this festival would be a great fit. It really is the celebration of all things livestock in honor of Cedar City's heritage. So why are they walking down the street? In Iron County, fall means harvesting the crops and the trailing of livestock from the mountains to the desert for winter, and since 1870, it's been the area's annual tradition to parade the livestock down Cedar City Main Street in the process. And if that doesn't interest you, the festival also includes a vintage car show, a sheep wagon show, a sheep parade, a quilt show, and plenty of other activities. Petersen Family Farm insists that its Harvest Festival is a way to say thank you to its community, but really, the festival is just one more reason for the Utah community to thank Petersen Family Farms. A classic fall harvest festival, the event includes an animal show, face painting, pony rides, food trucks, live music, games, a corn pit, and tons of pumpkins. View more Utah Festivals, Fairs and Parades.